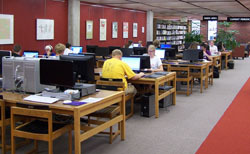 Preus Library has ten public access computers available for use by all Preus Library guests. Eight computers are located just inside the library's main entrance, between the Circulation Desk and the Research Help Desk. An additional public access computer can be found on both upper and lower floors of the library, located underneath the clocks by the stairwell. 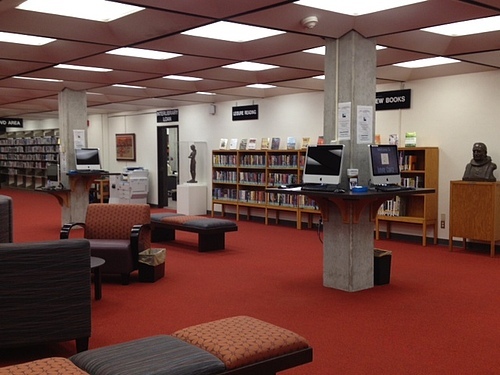 There are laptop computers, digital cameras, video cameras, and other media equipment available at the Circulation Desk for checkout for the campus community. Two computer labs are available in Preus Library for student/faculty/staff use. One is found on the main floor, next to the Technology & Research Help Desk. This lab consists of Windows PCs, and features specialized video editing stations (Windows and Mac) and double-sided printing. The second lab is located on the lower floor, near the SASC/TRIO Achievement Program offices. This lab has several PCs and a few Macs, and although it is often used for SASC/TRIO Achievement Program tutoring, it is also available for general campus use.